When their stomper breaks down in a blizzard a troupe of stranded entertainers finds themselves relying on the hospitality of a mysterious loner. Tara finds Rolph's enigmatic nature alluring as she and her friends trade stories for shelter in the storm. As she shares her tale of a girl orphaned and saved by the Fae, Rolph finds himself equally enchanted. But Rolph's somber trade, a tale of a man cursed to a beastly nature because of his own foolishness, does little to frighten her away. Can two strangers who have seen the darkest consequences of mortal life be joined by more than mutual sorrow? If saving Rolph from his beast costs a priceless treasure will Tara be willing to give it? If you love steampunk romances, Carina Press is the place to go. While mild on the steampunk elements they play an important part of this story's set-up. Though only novella length, there's a lot packed into this story. As each character shares their story there's a depth added. I tend to get a little blah in novellas without plenty of action but BEAUTY IN THE BEAST's action is very much in the subtleties as Tara and Rolph observe one another. I rarely like when characters have the sort of insta-love that comes with short stories but there's a smoothness to this one that was almost as satisfying as a full-length. Once the action gets moving the pacing gets quick, bringing in the paranormal elements that seem to be a staple of my reading. It makes a rich blend and in the end this was a novella I couldn't wait to tell people about. 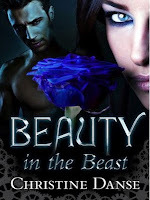 While not a true Beauty and the Beast retelling, there's very little of the fairy-tale here, it's sure to entertain fans of such. The only thing I didn't like about this one was that it ended! I would very much enjoy reading more in this particular world Danse has created. Highly recommended to readers looking for a blend of romance, steampunk, and paranormal elements that enjoy novellas.